Receive 100% up to £500 on first deposit. Deposit & bonus must be wagered 100x to clear. 30 days to meet the requirements. Ladbrokes offers a 100% up to £500 bonus which can be cleared by playing blackjack. To clear the bonus, you must wager 100x your deposit and bonus. Therefore, a £500 deposit, which yields a £500 bonus, will require £1,000 * 100 = £100,000 to be wagered before cashing out. If you bet £25 per hand, that is a total of 4,000 hands. The 100x WR is for standard varieties of blackjack for the bonus. Note that Blackjack switch, Blackjack surrender & Pontoon have a WR of 400x, so we recommend avoiding them. £30 minimum deposit required. Bonus must be cleared within 30 days. 18+. New real money customers only. First deposit only. The Wagering Requirements for all bonuses must be met within thirty (30) days of your bonus becoming active. T&C’s apply. This blackjack bonus can be redeemed upon making an initial deposit to receive a 100% match up to $200. 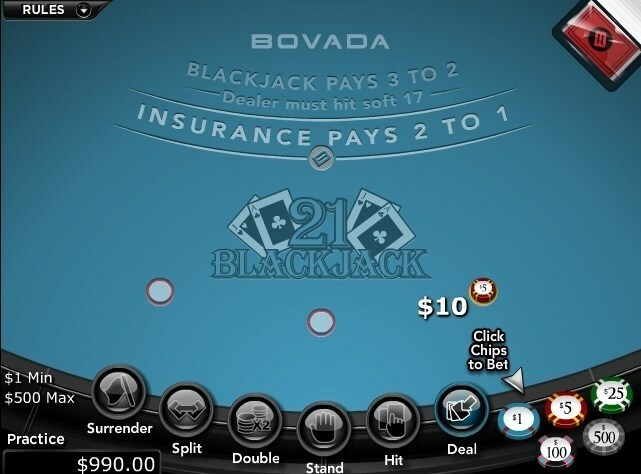 Players need to wager 30 times the bonus amount; however, blackjack only contributes 10%, meaning a player would have to wager 300 times the amount of the bonus. For example, if you deposit $200 to receive the full $200 bonus, you would have to wager $200 * 300 = $60,000 before making a withdrawal. This bonus is cashable, and you must complete the wagering requirements within 90 days. Open an account with bet365 today and claim your 100% Deposit Bonus. 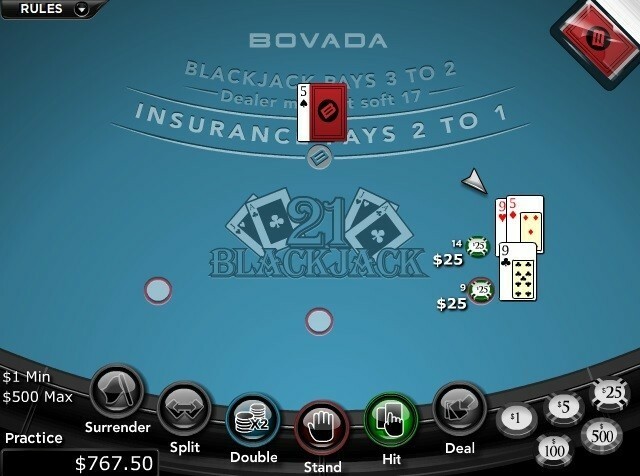 Blackjack is a casino table game pitting one or more players against a dealer. Each player receives two cards and after looking at them, can request more. Every card is worth a specific number of points. The object of the game is to get closer than the dealer to a point total of 21, without going over. Each extra card is dealt one at a time, and players can request an additional card as often as they want until they reach or exceed 21 points. After the players have made their decisions, the dealer plays his hand. 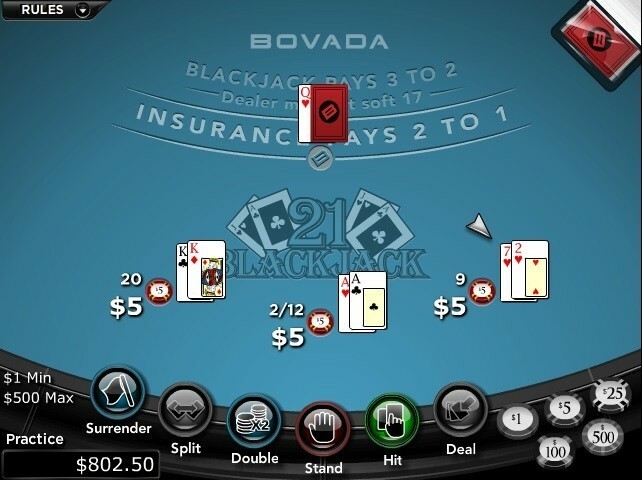 Once the dealer is finished taking his actions, his hand is compared separately against each individual player’s and the appropriate payouts are made. In blackjack, the dealer traditionally deals from a shoe containing several shuffled decks. At the beginning of each hand, the player chooses and places a bet within the stated table limits. Blackjack table with initial cards dealt. 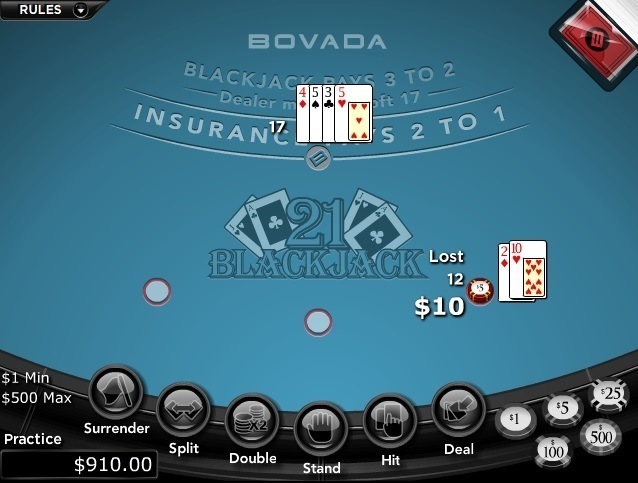 The player’s 8 and J are worth 18 points.If the dealer has blackjack (a total of 21 on the first two cards), the hand is over and the player loses the bet. Dealer has blackjack! Player instantly loses. 🙁If the player has blackjack, then he wins a special payout at a rate of 3-2 to his original wager. In other words, if a player has bet $10 and receives a blackjack, then his bet is returned to him and he wins another $15. Player has blackjack! Despite only betting $25, player wins $37.50.In the unlikely situation that both the player and the dealer have a blackjack, then the hand is a “push,” and the player takes back his wager. 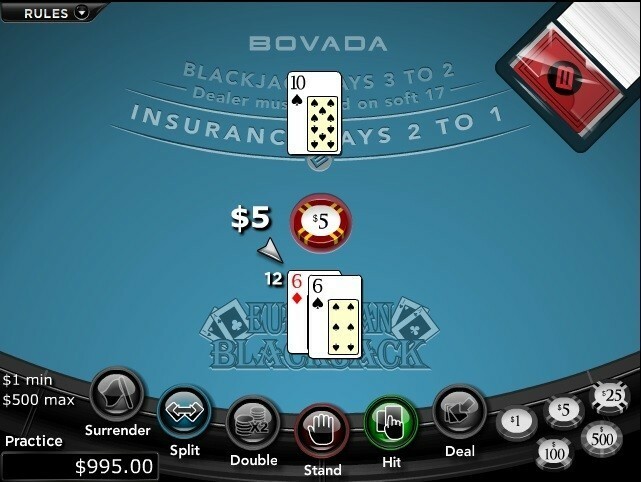 If neither the dealer nor the player shows blackjack, then play proceeds with the player having the chance to hit or stand. There are sometimes other options, like splitting or doubling, which we will get into in the section “Special Situations and Rules” below. Hitting means requesting another card, which the dealer will give the player. Note the Hit and Stand buttons outlined in red. They are the actions that you will be using the most.The player can keep hitting multiple times, then stand when he does not want any more cards. Player has already hit once; notice he has three cards. He can keep hitting or can stand.If at any point the player’s point total is greater than 21, then he is said to have “busted,” and he loses the hand and his bet. Player has busted with a total of 26. Player loses.Once the player elects to stand or has busted, then the dealer gets a chance to play his hand. The dealer will turn over his down card, figure out how many points he has, and keep hitting until he has 17 or higher. The dealer will stop hitting with a total of 17, 18, 19, 20 or 21. If the dealer goes over 21, then he busts, and the player wins an amount equal to his bet. Note that if the player has already busted, then his bet is already lost. The fact that the dealer busts later on does not help that player at all. The dealer has busted. Because the player has not busted, he wins.If neither the dealer nor the player have busted, then their point totals are compared. Whoever has the highest value wins the hand. If the dealer wins, then the player’s bet is forfeit to the house. If the player wins, then his bet is returned to him and the dealer pays him an amount equal to the size of his bet. Neither player nor dealer has busted. Dealer’s score (17) is higher than player’s (12), so dealer wins.If it’s a tie, then the hand is said to be a “push” and the player’s bet is returned back to him. Player and dealer both have the same total (21). It is a push; bet is returned to the player.After the appropriate payouts are made, the hand ends and the dealer begins the next hand. If the dealer has an ace as his up-card, then he will offer the player insurance before continuing with the hand. This insurance is a bet on whether or not the dealer holds a blackjack, and it pays out at 2-1 odds. A player can bet an additional sum up to one-half of the original wager on insurance. The dealer will then check for blackjack and pay out as appropriate. Because the dealer has an A showing, the player is offered insurance.For example, suppose a player has bet $10 for his main bet and then the cards are dealt. The dealer shows an A up, and the player has received a T and a 7 for 17. The dealer will inquire if the player wishes to purchase insurance. Let’s assume the player makes a $5 insurance bet. The dealer will check if he has blackjack. If he does, then the player will lose his $10 bet and the hand will end immediately, but the $5 insurance will pay out at 2-1, so the player will receive $10 and break even on the hand. If the dealer doesn’t have blackjack, then the player’s $5 insurance bet is lost and the rest of the hand proceeds like normal. 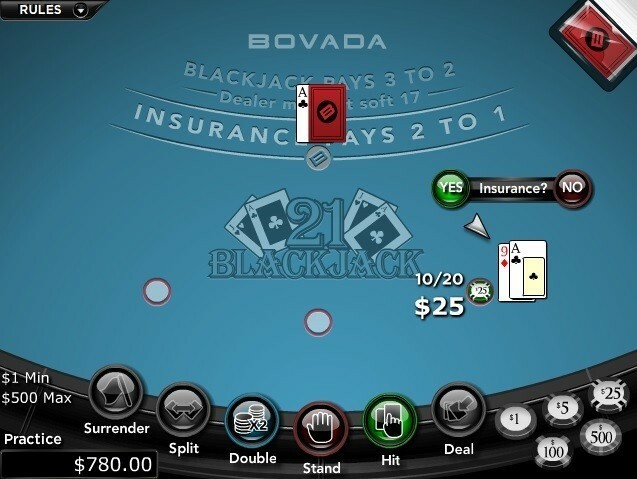 A special instance of insurance occurs when the player himself has a blackjack and the dealer shows an ace up. In this case, the player will be offered “even money” in replace of the insurance bet. Even money guarantees an even money win, even if the dealer has a blackjack as well. Though if the dealer does not have blackjack, you still only win even money instead of 3-2. Insurance is typically a bad play with a large house advantage. Players should not buy insurance if they’re concerned about maximizing their expected value. 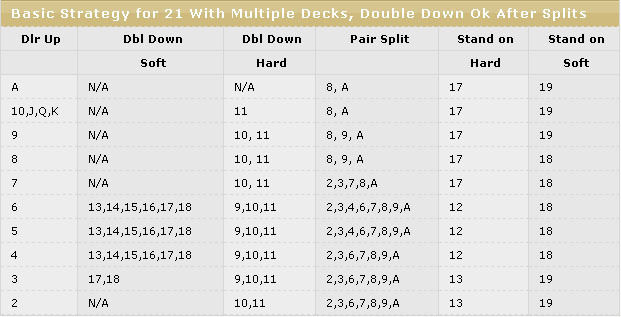 Doubling down is a special action that a player can take when he has only his original two cards in front of him. When a player doubles down, he places an extra wager equal to his original wager. In exchange, that player receives one, and only one, additional card. You are basically doubling the stakes when you think you have an advantageous position at the expense of forgoing the opportunity of receiving more than one card. Dealer shows 2 while player has 11, an excellent double-down spot. Player can click “Double” (outlined in red). Splitting is a special action that a player can take when he has only his original two cards in front of him and they have identical rank, i.e., the player has a pair. The player can elect to place an additional wager equal to his original bet on the table. The player’s hand is then split into two hands, and each one is now considered separate. The dealer will deal one more card to each hand, and the player can hit, stand or double on each hand independently. In most cases, a player can even split the hand again if he again receives a pair. A player can thus have three or more hands going simultaneously. Player has a pair of 9s and the dealer has a 5. This is a good situation to split by clicking “Split” (outlined in red). Player has split the 9s and received a 5 on his first hand. 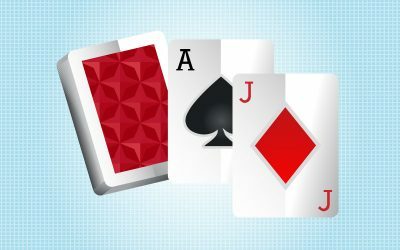 Once he plays out that hand, he will play his second hand separately.If you receive a pair of aces and split them, you will almost always receive only one card to each split ace. You cannot then hit, double or resplit to your new hands. If you receive a card such that your split hand is worth 21 points, this is not considered a blackjack and you will not receive the 3-2 payout for player blackjack. 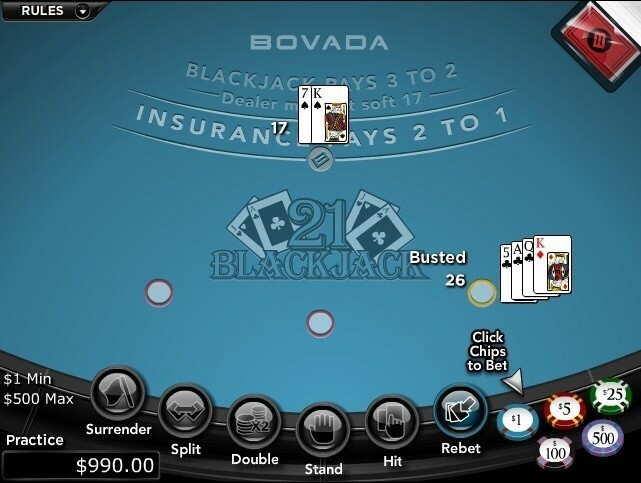 In most traditional, offline casinos and many online casinos, more than one player can play blackjack at a single table. When this is the case, or indeed when a single player plays more than one spot at a table, all players and the dealer are given their initial two cards, like normal. Play then proceeds clockwise around the table. Each player plays out his hand in order, either busting or standing, and then play proceeds to the next player at the table until all players have played their hands. The dealer then plays his hand and pays out each player or collects losing bets as appropriate. Player is playing three hands at a time. Each hand is played in order until player busts or stands and then the dealer plays his hand.The point totals of other players have no bearing upon a specific player’s winning or losing. All players’ hands are compared individually against the dealer’s to determine wins and losses. Every single player can lose to the dealer in a given hand, and all players at a table might win at the same time during a hand. 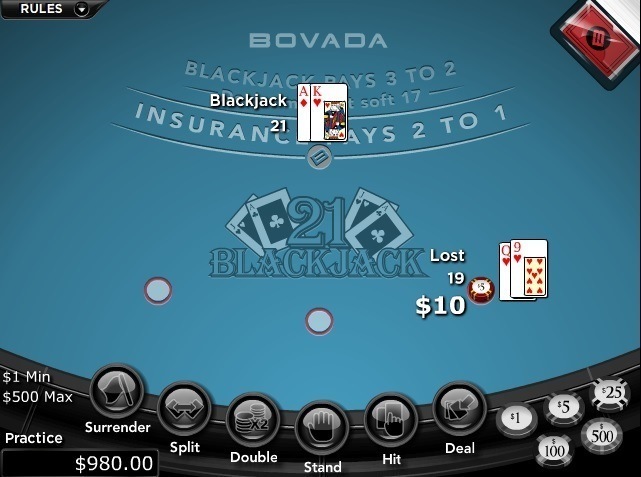 Because there are a reasonably small number of combinations of player’s point totals and dealer’s up-cards, blackjack is a game for which the correct strategy in every situation can be encapsulated in a chart. This strategy is known as “basic strategy.” Here at FlopTurnRiver, we’ve created a chart to help you make the correct basic-strategy plays at the tables. While basic strategy does change slightly depending upon minor variations in the house rules (see “Blackjack Rule Variations” below), our chart is applicable in the vast majority of games spread online. The general idea of proper blackjack strategy is that when the dealer has a 6 or lower showing, you’ll want to hit any total of 11 or below but stand when you have 12 or above. When the dealer is showing a 7 or higher, then you should keep hitting until you have 17 or above. The chart above will help you with the exceptions to these basic rules, which are mostly situations where you can double down, split or have a “soft hand” – a hand containing an ace with a value of 11. By properly using correct basic strategy, you can often reduce the house edge to 0.5% or even lower. With an edge of 0.5%, you could bet a total of $1,000 on many hands of blackjack, and the casino’s expected win will be only $5! Blackjack is mathematically the best game for the player when compared to slot machines, roulette, Caribbean stud, keno, and almost every other casino game. As tiny as the house edge is in blackjack, there are ways to reduce it even lower by the use of card counting. Card counting allows players to keep track of when the deck is in a favorable state and adjust bet sizes accordingly. With the proper use of card counting, a savvy player can turn the tables on the house and achieve a mathematical advantage for the player! 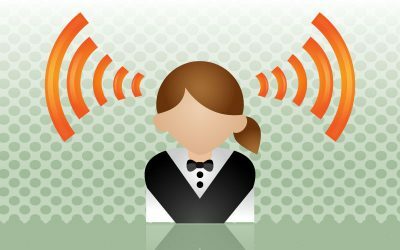 Card counting is an advanced technique and is mostly feasible only in brick-and-mortar play, not online, so we won’t go into the details of it here. 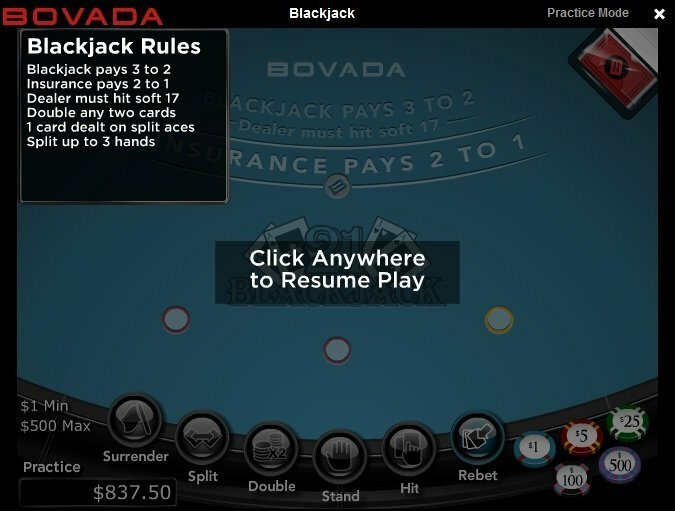 The list of house rules for Bovada’s standard Blackjack game. 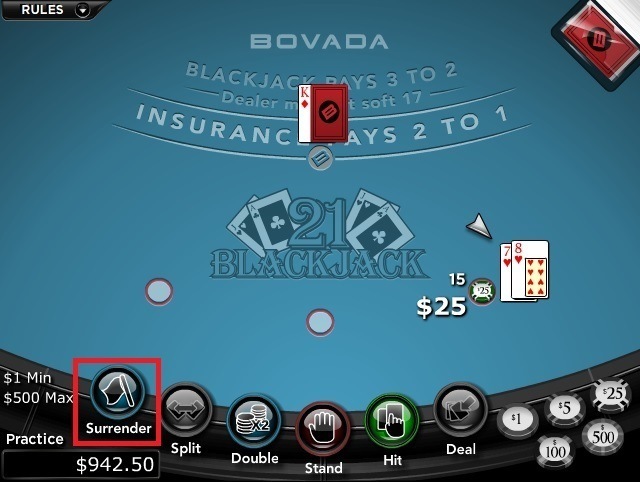 At casinos that offer surrender, a player can look at his initial cards along with the dealer up-card and decide that he doesn’t want to play the hand. The player forfeits half his original bet and retains the other half. The hand is then over. Surrender is an option that’s favorable for the player. The dealer has a king up while the player has an abysmal 15. This is a good time to save half a bet by clicking “Surrender” (outlined in red). Some blackjack games are dealt from a single deck, but others are dealt from a multideck shoe. 1, 2, 4, 6 and 8 are all common numbers of decks to use in blackjack. Generally speaking, the fewer decks, the better the player’s chances. Most of the time, a dealer with a 17 will stand. However, at a lot of casinos, a dealer with a soft 17 (a 17 containing an A equal to 11, like A6 or an A24) will hit to it. The dealer hitting on soft 17 is beneficial for the casino while the dealer standing on soft 17 is to the player’s advantage. In some cases, player blackjack pays out at a rate other than 3-2. A common alternate payout scheme is 6-5. In almost every case, the altered payout is less than 3-2 rather than more. Since the extra payout for having blackjack is very important in realizing your equity, any decrease in this payout is very bad for the player. In rare cases, the insurance payout is also altered. Since insurance is generally a bad bet, which should never be made, this has a negligible or nonexistent effect on the house advantage for a player using the correct strategy. You can usually double down on any two cards, including after a split, but at some places, this is not true. Some casinos restrict players to doubling down only on certain point totals. 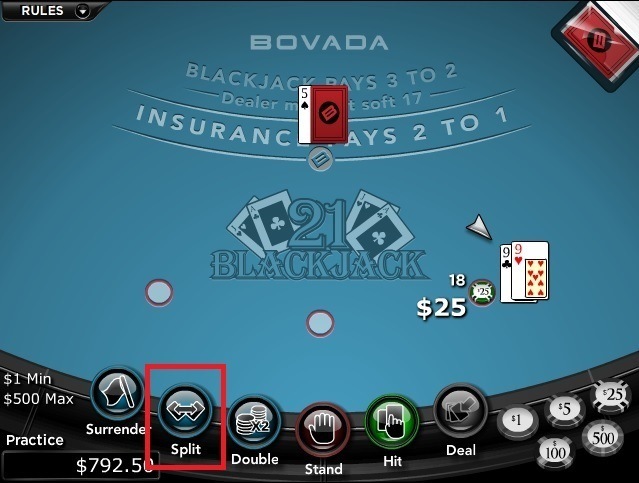 In other cases, the player cannot double down after a split. Any restrictions on the ability to double down are bad for the player. 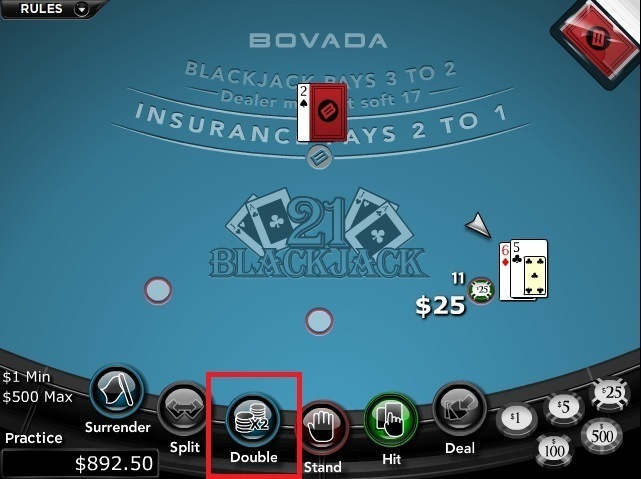 While doubling down involves placing a second bet equal to the first, you may be able to “double down for less.” Although it’s rare that you would ever want to do so, the option to double down for less than your original wager does give the player a very slight advantage. You usually cannot keep splitting your hand indefinitely even if you keep getting pairs. You will mostly be restricted to splitting until you have two, three or four hands. The more times you’re allowed to keep splitting, the better it is for your bottom line. If you split aces, it’s almost always the case that you will receive only a single card to each ace and cannot hit, double or resplit. The rare games that do allow you to resplit or hit to split aces reduce the house edge to the player’s benefit. In some blackjack games, particularly those labeled “European Blackjack,” the dealer does not deal himself a down-card until the player has made all his plays. 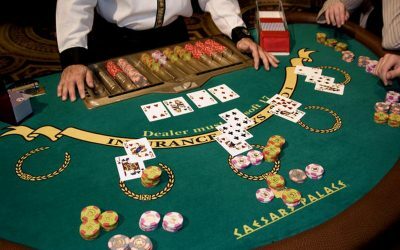 This means that the dealer will not check for blackjack immediately, and players will have the opportunity to split and double while playing out their hands before the dealer’s blackjack is revealed. This is very unfavorable for the player and has major basic strategy implications when the dealer shows a T or A up. However, some casinos with this rule also have an “original bets only” (OBO) rule, which means that only the original bet is forfeited in the case of a dealer blackjack. The OBO rule cancels out the bad effects of not having a dealer hole card. A European Blackjack table. Note that the dealer has no down-card. While it’s sometimes tough to choose among the myriad options available for online play, you would do well to check out Ladbrokes. Licensed by the UK Gambling Commission, Ladbrokes was founded in the year 2000 and has a workforce of thousands, so it has the experience, regulatory approval, and size that you want in an online blackjack provider. You can play blackjack instantly in your web browser or you can download client software created by Playtech, one of the most reputable casino software providers. 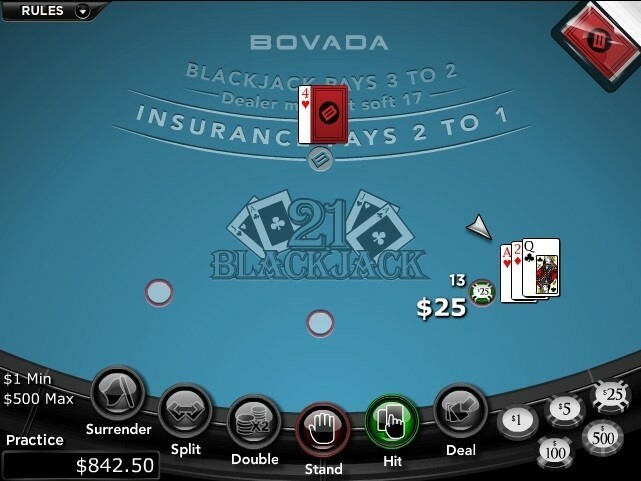 There is also a live dealer blackjack option if you want the complete experience of watching physical cards being dealt. There are more than 250 other casino games that you can try your hand at. As a full-service gambling company, Ladbrokes offers sports-betting, poker, bingo and other types of games for you to play. You can even bet on currency fluctuations and stock market indices! Almost the entire range of Ladbrokes’s offerings is accessible from your smartphone, tablet or other mobile device. For more details on Ladbrokes, make sure to read our full review. Like many popular gambling games, the exact origins of blackjack are shrouded in the mists of time. There are references to a game called “ventiuna” (twenty-one in Spanish) in the works of Miguel de Cervantes, the celebrated author of “Don Quixote.” The game, as described by Cervantes in the year 1601 or 1602, bears a remarkable resemblance to modern-day blackjack, so blackjack has been around, in some form, for more than 400 years. It was a French version of the game, called “Vingt-et-un,” that spread to early casinos in the United States. Perhaps feeling that they needed to jazz up the game somewhat to generate excitement, several casinos started offering a payout of 10 – 1 for a hand containing the ace of spades along with a black jack (jack of clubs or spades). This special bonus was called “blackjack.” While this rule variant did not last long, the name of the bonus payment lingered on to become the name of the game as a whole. Today, almost every casino spreads blackjack, including both live and online casinos. It is perhaps the most popular casino table game in the world. You will therefore be able to find a game almost anywhere you look.